Intentional attacks on the Palestinian population can be deemed a war crime and accountability for violations of international law must be imposed, Bill Van Esveld, Israel, Palestine researcher at Human Rights Watch, told RT. 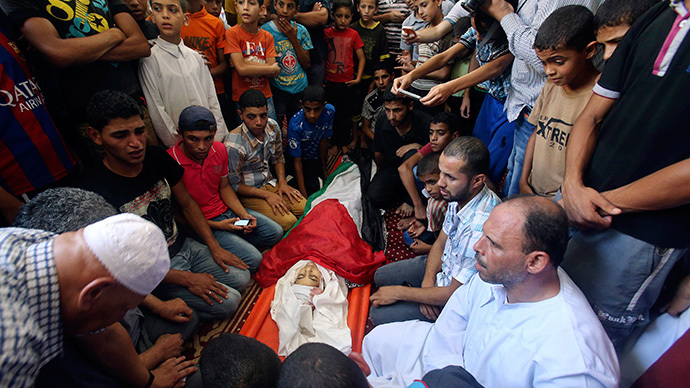 RT:As we know, the death toll in Gaza has climbed to 100. Many of them are children under the age of 17 – we’re talking about dozens here. Do you think the issue’s getting enough attention, considering the amount of civilian deaths? BE: I think the general issue is getting enough attention, but the civilian suffering is not getting enough attention – it’s not getting enough attention from the Israeli forces who were conducting those airstrikes, naval strikes, tank shelling, and other forms of attack. Under the laws of war – which bind Israel as they bind any military force – you cannot shoot first and ask questions later. You have got to make sure what you’re shooting at is a legitimate target, and if there’s any doubt in your mind whether it might be civilian, you have to hold fire, and I’m very concerned that we are not seeing that – we may be seeing the opposite. RT:Israel is saying it’s acting only to protect its population from Hamas – but since 2008 over 1000 civilians were killed in Gaza. That’s about 20 times more than the Israeli civilian death toll. And if we look at the total number of Palestinian children killed since 2008, we’re talking about over 500. Do you think Israel’s response is measured considering all this? BE: Well, it’s not a question of whether Israel has a right to defend itself – that’s an obvious yes; of course they have a right to defend themselves. The question is how they are going about it. When they make mistakes, do they learn from them? When forces do something deliberate or reckless are they punished? And the answer to those last questions is a clear “no.” We’ve seen virtually no accountability for very well-documented past cases of abuse, violations, and even war crimes, and without accountability and with impunity, then abuses will obviously continue. RT:We’re interested to hear what you have to say about what the former mayor of the Israeli town of Shiloh thinks – he says the only way to win this war is to destroy the enemy without excessive regard for who’s a soldier and who’s a civilian. How does your organization respond to a statement like this? BE: Well, that would be a complete disaster and I hope that nobody listens to that official. If that official were a commander in a military and his troops acted on that order, he could be prosecuted for war crimes. That is a blatant out-and-out disregard for the most fundamental rule of war, which is to spare civilians, and there is a good reason for it. You weaken your enemy by attacking their fighters and their military objects. You do nothing to weaken your enemy by attacking a civilian population who’s not fighting you. It does nothing for you; it’s a war crime, and it should not be advocated. RT:World leaders are calling for an end to the violence, but Israel seems determined to continue. What do you think it would take to agree a truce? BE: It’s difficult to say at this point; obviously both sides feel that they need to keep doing what they’re doing which is harming – unfortunately – civilians. World leaders need to make a very clear statement that the violations of the objective laws – the laws that apply to both sides – will not be tolerated. Not to just say things like “We call for restraint” or “We hope the situation will go away.” They need to make it clear that there will be accountability for violations and this is going to be looked into and it’s not going to be swept under the carpet as the Goldstone Report was eventually put aside after the terrible carnage in 2008/9. My organization has been calling for the state of Palestine to go to the ICC for a year now, and it’s high time for them to do that.